Olay Magnemask Infusion Hydrating Jar Mask Starter Kit is a jar face mask and magnetic infuser for fine lines and lack of firmness. The Infusion Hydrating Jar Mask has a lightweight formula with a soft melt-in texture to enhance penetration. It helps improve skin texture and elasticity, and delivers moisture boosting benefits after just one night, providing up to 12 hours of hydration with each use. The Magnetic Infuser has been specially designed and developed to enhance the penetration of the Olay Magnemasks and is exclusively tuned to the molecular properties of niacinamide (vitamin B3) and penta-peptides (PAL-KTTKS), key ingredients in the mask formula. The kit includes: Infusion Hydrating Jar Mask 50g and 1 x Magnetic Infuser. Firstly thank you to the trial team for sending me this product! It was actually a great experience trying the products. Olay isn’t usually a brand I would go for, but after trying this mask started kit, I’m a massive fan now! I love the magentic massaging handpiece that came in the kit, it was fun to use and I love how cool and refreshing it felt when I used it with the jar mask. I used this maybe once a week and the sheet mask also. I found together they helped my skin retain moisturise and made my skin feel really soft. For a first time Olay user it was very enjoyable, they product was easily absorbed and delivered good results. I also like to leave the magnetic handpiece in the freezer to make it really cold when I went to infuse the mask. This was super relaxing on the face and especially on days where it was really hold. Anyone wanting to start out adding masking to their skin care regime. And for skin types that really need added moisture. Thanks BH and Olay for including me in this trial! The product came in attractive packaging - the gel cream in a screw top jar and the magnet in its own velvet pouch. The gel itself was light weight, non-greasy and left my skin feeling hydrated. During this trial I was exercising quite hard so had redness and was probably dehydrated at times but I would use this every night before bed and would wake up to fresh, smooth, hydrated skin so it's a winner in my books. The magnet itself has a handle section for easy holding/application and you simply run it over your face in a circular motion after you apply the gel. I couldn't help but feel silly using the tool as it felt like a fad but I can't argue with the results. You can of course use the gel without the magnet but the hydration doesn't penetrate your skin as deeply. Overall I would definitely recommend this product and would continue using it as it left my skin feeling amazing. This product was easy to use and fit into my daily skin regimen, with the suggested usage on the packaging being 3-4 times/week depending on how your skin feels. For this trial, I was asked to use the Magnemask hydrating mask starter kit twice a week. The packaging was eye-catching with both the picture and words in bold print. Upon opening the jar, I noticed a slight, but not unpleasant smell. It felt light, soft and gentle on the facial skin and absorbed easily– a small amount went a long way. My skin immediately felt hydrated and moisturised, and though a slight stickiness was evident as well, this gradually dissipated over the course of the evenings I used it. The Magnemask hydrating mask starter kit was used in the final step of my skin care routine at night. It would definitely suit a dry/dehydrated skin type, though sensitive skins could benefit unless they felt they were allergic to some of the ingredients. I loved using the magnet provided for our trial for deeper infusion of the cream into the skin. The 50g size jar for the Magnemask hydrating mask starter kit ensures the product lasts a while and this makes it affordable for many customers. Though my skin has felt amazing since using this product, I noticed, at least in the early stages of the trial, that my skin was a little sun sensitive the following day, which may have been due to one of the ingredients – maybe salicylate – but this disappeared after a day or two without using the product. Thank you BH for letting me trial this product! The mask kit came with a jar of cream, a magnetic infuser and a nice storage bag. There is a lot of product in the jar so it definitely lasts a long time. The cream doesn't have much of a smell, which some people might prefer, although personally I like it when the products I use are slightly scented. Initially I used the magnet that came with the product as it does give a nice facial massage. However I didn't notice any significant difference of using the magnet as opposed to using my fingers in getting my skin to absorb the product better. After a month of regular use of the product, I did notice that my skin was a lot softer and smoother than it had been previously, and was also whiter and plumper. Overall, I would continue to use this product as it has been effective in hydrating my skin and keeping it looking fresh. The product itself comes in a sliver/opaque jar with a silver lid, the lid itself 'locks' in, so no risk of accidently having the jar spill open or dry out. It also comes with the magnetic infuser which looks like a little plug, stored in velvet bag. I used this product 2-3 times a week, and found that my skin became smooth and extremely hydrated which lasted overnight and into the next day. I'm unsure how or if the magnet works as I couldn't 'feel' it. However, my skin definitely felt that it had life injected back into it. My skin felt plumper, softer and the overall dryness of my skin subsided. The mask has a thicker cream like consistency, easily dispersed by the magnet on the skin. I applied through dots over my face to ensure an even and widespread coverage and massaged for two minutes , it's reccomended to massage the product fully and wipe off. The magnet on colder days was cool on the skin before warming up, a nice feeling on the face! I found that the product didn't have a strong scent and was absorbed well into the skin not leaving unnecessary or messy residue. I would reccomend this mask to friends and family, especially those with dry skin as personally this was an intense moisturising mask that did not strip my skin after use. I had the pleasure of trialing the Olay Magnemask Infusion Hydrating Jar Mask Starter Kit and the Hydrating Sheet mask five pack. The packaging is super luxe. Super cute and definitely feels very fancy. I tried the jar mask first and i really liked that it was a gel texture rather than a thick cream. I didn't really notice a smell with it which is great because sometimes heavy smells can be irritating when you need to have it on your face for a while. I used the magnet for about 2 minutes each time I tried the mask. I used the jar about 3 times a week and once a week I did the sheet mask. The magnet that comes with it is great. I'm not sure if it made any difference using the magnet versus your hands but I do like that it feels like a nice little face massage. I think it definitely made a difference, my skin was plumper and more hydrated. It wasn't irritating and you would get many uses out of one jar. Can't wait to keep using this! If you can trick someone else into using the magnet on your face, it will feel almost like a mini facial. Dry skin definitely, but I have oily skin and I found that it did a nice job without making my face super oily or heavy. I really enjoyed trying Olay Magnemask Infusion Hydrating Jar Mask Kit! The cream it self is very light, gel like and I like it!! It’s lovely on the skin and smoothes over easy with the magnetic infuser. The magnetic infuser fits nice in the hand and after a couple of nights I got an hang on how to use it it, I think, it makes a difference. The product gets massaged in to the skin and my skin felt a little warm of the massage and the magnetic infuser and my skin was glowing after using it so much that I actually used it (not only at night time as it’s supposed to be used) but even in the mornings! I used it 3-4 times a week and I also massaged it in on my décolletage and neck after I exfoliate and cleaned my skin. I was super excited to trial the new Olay Magnemask Infusion Hydrating Jar Mask Starter Kit as I have very dry skin and am always looking for a nourishing boost. Being a big fan of Olay, I was a little disappointed in this product. As I applied the mask I found the lotion to be more of a light moisturizer then a mask, which absorbed into my skin very quickly, smell was also pleasant and not to overwhelming. I then went on and did as the directions said and used the magnetic infuser, which I found to be an unnecessary step in the process and a tad gimmicky. It was a little rough on your skin as it doesnt contour to your face and felt a little plasticky. Overall a nice light mosituriser though wouldn't recommend as a hydrating mask. I also think that applying to face with just your fingers is more then sufficient to achieve desired results. As part of the trial, I alternated between the sheet masks and the jar mask. I used a mask roughly 3-4 times a week, but this is safe to use daily. I had a very stubborn dry patch on my nose that would not go away. Regardless of what I used. After using this mask once, it started getting better. Three times and it completely disappeared! The mask itself is a thick, white, creamy substance. It comes in a jar, so you need to make sure you have clean hands before putting your fingers into the pot. I couldn't notice a fragrance either which is a nice change. I applied the face mask, left for a couple of minutes and then massaged with the magnetic applicator supplied. There was no sensation from the magnet either. When using the magnet it is best to use small circular motions, to increase circulation to the skin. Overall, my skin looks healthier and more hydrated. It also didnt cause any breakouts or redness! I was very lucky to be selected for the trial team for this product. I was particularly excited as have been struggling with some dry patches on my face recently. I was concerned that this product may just be a gimmick, however I have been quite impressed by the results. I have been using the jar mask one to two times a week. I think it's more of an intensive night cream than a face mask, as you do leave it on overnight. The texture of the cream is almost a gel-cream hybrid, and it is translucent milky white in colour. It is scented, but I don't find it overpowering, and it did not irritate my skin like some other strongly fragranced products do. I tried applying the mask just with my fingers to see if I noticed a difference between using the magnetic activator, and I actually did notice a difference. I much prefer using the activator to apply the mask, as it seems to absorb better in to my skin, and my face feels silky smooth after applying. I can notice a huge difference the next morning when I wash my face, as it still feels incredibly smooth and soft. I have noticed that my dry patches haven't returned, and my makeup is applying really nicely. This is a product I can see myself continuing to use. Thank you Beautyheaven for giving me the opportunity to trial Olay Magnemask Infusion Hydrating Jar Mask Starter kit. The kit comes with a jar face mask and the magnetic infuser. The packaging of the kit is nice, the cream comes in a silvery jar with a silver lid, and the magnetic infuser comes with a little pouch. The cream has a pleasant smell, not overpowering. I have used this product three times a week for the last three weeks. To use, I spread the mask evenly and I massaged it with magnetic infuser into my skin with circular motions for a couple of minutes. I used it in the evenings before going to sleep, and a found my skin so soft and smooth the next morning. My skin definitely feels more hydrated after using it. I look forward to continue using it until I run out, but I’m not sure if I would repurchase it because of the high price tag. I was lucky enough to be invited to the trial team for the new OLAY MAGNEMASK INFUSION HYDRATING JAR MASK STARTER KIT and was super excited as I was battling extra dry skin from the winter. I was confused with the product as it was this plastic "magnet" along with a tub for the mask. I had to read the instructions a few times for taking the dive and giving it a go. The consistency of the mask was luscious and felt velvety soft - it does has a slight scent but nothing that lingers or offensive. Once you spot some mask all over your face you pull out the magnet and use it to run the contents around your face until the mask has absorbed into your skin. I thought it was super gimmicky and wasn't sure it was working. It has to be used before you apply moisturiser so I had my facial oils one and serums and it felt like it just rubbed off the previous products.  I have tried it after cleansing and it felt much better and provided some really great hydration. I also used it without the magnet and it did not feel any different. Use this after cleansing before you put on serums, oils or creams. Thank you Olay and bh for this trial opportunity. I thoroughly enjoyed using the Olay Magnemask Infusion Hydrating Jar Mask Starter Kit. I want to note that I also received the Hydrating Sheet Mask so I used these masks in combination with each other in the trial over a few weeks. The concept is interesting and I like the idea of using a tool top help product absorb better and provide additional benefit. The one thing that I love about this mask is that it is used as the last step of my skincare routine. Traditional face masks are used as the first step and I typically forget and go straight to using my serum and moisturiser. However, the Olay mask makes things much more simple for me and I never forget. As per the instructions given, I used the jar mask twice per week and I used it at night. After I have applied all my skin care products, I apply the mask like a regular moisturiser and then use the magnetic infuser to massage the mask in for about 2 minutes. It is quite straightforward to do and relaxing too. After a few weeks use, my skin did look natively hydrated and some dry spots have disappeared but I haven’t seen any improvement in fine lines or wrinkles. Overall, I enjoyed using the jar mask and magnetic infuser and will likely purchase again. I was curious about this duo as soon as I saw it. I wasn't sure what it was suppose to do or how it was suppose to help my skin. I have seen jade rollers but magnet tool is a first! I found the lotion to be ok but as some others have motioned, it is slightly thick. I applied the lotion all over my face and started to massage the lotion in with the magnet tool. It said to avoid the eyes so that's what I did. I wasn't sure what the magnet did to be honest, I have been using it for weeks now and still didn't feel any difference. I did like the lotion, not sure if I was suppose to but I have been using it on as an over night mask kinda thing. by applying a generous layer at night and leaving it on to sleep then I'd wash it off in the morning. Would I buy this after I have finished it? probably not. 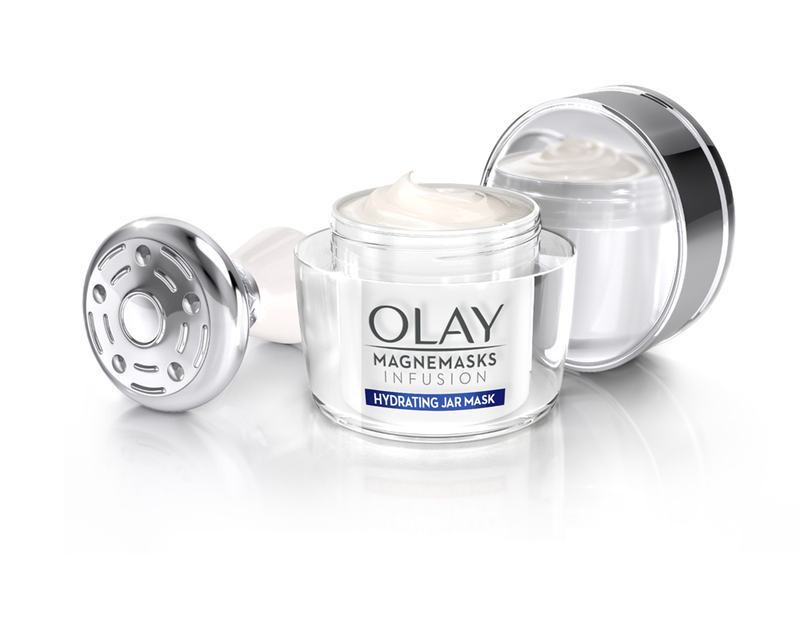 The olay magnemask hydrating infusion jar mask comes in sleek packaging. Inside the box is a small velvet pouch containing the magnemask massager. The mask comes in a beautiful jar that is easy to open. The jar mask is a whitish light consistency liquid, that feels like a light cream. It smells beautiful and goes on skin very smooth and is quickly absorbed. The massager is metallic and has a round head. It massages the skin well and helps with the absorption of the mask into the skin due to its magnetic properties. After applying the mask the skin instantly feels smooth and fresh. The massager further helps by helping with increasing the skin blood circulation. After 3 weeks of using the product twice a week before bed, I have noticed that my skin feels hydrated, fresh and luminous. Other people have also commented on my glowing looking skin. I would recommend it to anyone who feels the need to rejuvenate their facial skin. Apply before bed twice weekly ideally after cleansing face. A big thank you to Olay and Beautyheaven for a chance to trial and review the Magnemask Infusion hydrating jar mask starter kit. A bit of a disclaimer, this was trialled in conjunction with the matching sheet masks, so overall results are in conjunction of both products. The mask itself its different to other masks, as in, its more of a night cream you use every other day or 3 - 4 times a week. It completely absorbs into the skin and no need for rinsing. It is a light weight, gel like consistency and absorbs into the skin. The scent is light but sweet. The magnet it comes with, is meant to be used for 1 to 2 mins, to help 'absorb' the ingredients. I am a bit sceptical about the pseudo science involved in the magnet. I tried it for a few days and found it quite time consuming and when I changed to using my fingers I cant say I saw a lot of difference. I found it a bit of a gimmick more than anything, a way for the product to try and stand out, but not sure I really found any value in it. At $54.99 I would have wanted better results. I personally would not be rebuying, but glad I had a chance to give it a go. Thanks again Beautyheaven and Olay. The idea of using magnet repulsion to drive active ingredients more deeply into your skin is an attractive one; unfortunately I believe it is scientifically impossible if the substance is in suspension in a solution. And that’s effectively what happens when you put it into a lotion or cream. So I think you’re probably wasting your time using the magnetic thingy to massage the product into your face – you’d do just as well using your fingers. This aside, this is a nice lotion to use. I really enjoyed the light, cool feel of it. It does sit on your skin for a few minutes before absorbing, but it feels so good that I wasn’t bothered by this. It absorbs quite quickly and I liked the way it made my skin feel. The advice is to use it twice a week, and after several weeks I feel I’m seeing a small improvement in both the hydration and texture of my skin. Overall, I’d probably recommend this, but with some reservations about the scientific claims. Times when you have a few minutes to let it absorb. I trialled the Olay Magnemask Infusion Hydrating Jar Mask Starter Kit, and found it noticeably made my skin feel softer and smoother overnight. One down side to this product though was I found it was a bit too thick (it wasn't greasy though), and therefore it felt a little uncomfortable on my skin overnight. I also believe the magnet applicator is perhaps a bit over kill - and after a few nights I just started applying the cream without this. I also have normal to dry skin, and found this product worked well for hydration, and I really liked the refreshing scent of the product. In summary, I would recommend this product to anyone with normal to dry skin, who wants a super hydrating moisturiser who doesn't mind a thick texture on their skin overnight. I would also recommend skipping the magnet applicator when strapped for time, as I found this step a little time consuming for no noticeable benefit. The Starter Kit comes well-presented package and is made up of the jar face mask and the magnetic infuser. The cream is housed in a silvery jar, with a silver lid and the magnetic infuser comes with a little pouch. The cream itself has a pearly, slightly shimmery appearance, and the face of the magnetic applicator has small crater-like dips in it, but it just glides over my face. My face has been especially dry this winter, so I was very excited when I received this package. I can't say that I noticed a huge change to the hydration of my skin after just one use, but I think that ongoing use, just like any skincare product I have come across so far, my skin will improve. You don't need a lot of the cream to apply to the full face; a little goes a long way. I used circular motions to infuse the cream into my face with the magnetic applicator, and started at my chin and worked upwards, against gravity. I use the cream about every couple of days, and really work the cream into my skin. All skin types, but especially useful for dry skin. The beauty of this cream is that because it's so lightweight it can still be used in summer, and it was neither greasy nor sticky. Not brilliant but maybe too early? I was excited when this okay magnemask package arrived as we all know it is all about the masks at the moment- especially preparing our skin for summer. I was excited to hear that it pushed the cream into the skin as well to really get beyond the top layers of the skin. I didn’t find the packaging overly appealing though the mask and the tool were reletively easy to use. I tried this product for a couple of weeks- twice a week and while afterwards my skin did feel soft and the product absorbed nicely into my skin- I just don’t think it worked. After a couple of weeks, I just don’t see any real change in my skin- though perhaps I need to use it longer? I’m sure this works for some people but I don’t think it is the right product for me. Thanks for letting me give it a go. Get ready to feel zen.